Sat, Sept 17, 2016 at the Farmington, UT shows ‘Gucci’ wins a major and BOV over 3 specials to finisher CH! She was moved up the following day and took BOV and a Group 2! So proud of, Bruce Swift, her loving owner, who handled her exclusively to her Championship! You two made such a great team, Bruce! What a joy it is to finish your own dog. 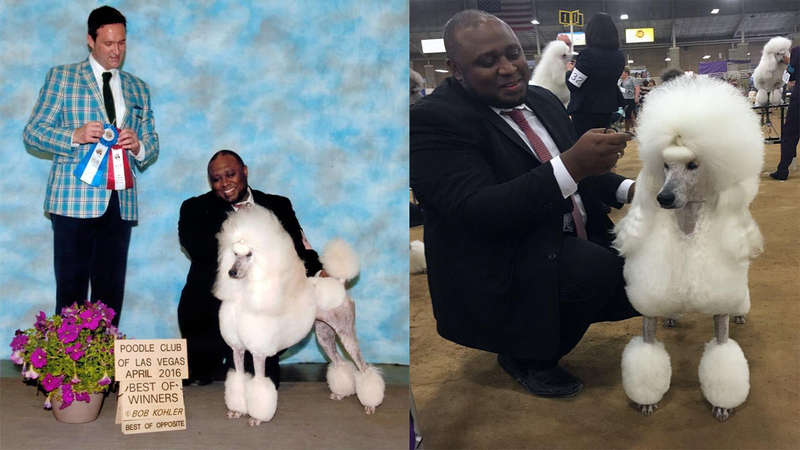 Gucci is now the 4th Champion produced by her dam “Grace” from her third and final litter. Can’t wait to see and post their win photo! We are thankful to the AKC judges, Dr. Wanda V. Spediacci and Mrs. Loraine Boutwell, for finding our girl worthy of these nice wins. Gucci will be now be known as CH Desert Reef’s La Dolce Vita Of Kotu. Congratulations shout out to her co-owner and co-breeder Karen Green as well! Our boys were so happy to see her finish. Gucci was temporarily named, Mia, by my children for her first 8 weeks of life. She was one of their favorites from that litter. They truly enjoyed hearing that she is a new Champion! Luna wins Best Puppy and Best in Sweeps!